Be sure to keep your specialty bake shop stocked with these convenient, brown glassine-coated candy cups. They're a must have when preparing truffles, chocolates, and other sweet treats! Each baking cup is made from glassine paper that has a high-shine for enhanced presentation. Additionally, the elegant fluted edge helps frame your candy to ensure it looks as great as it tastes! This glassine paper is also grease-resistant to ensure that nothing seeps thru the candy cup. Best of all, this paper releases easily and won't damage the baked sweet treat inside. These liners give your cupcake a professional look, like if ordering from a bakery. Keep in mind they are taller then your normal standard cupcake liner and will require extra batter, but highly worth it to give that extra look. Non stick baking cups are ideal for any type of baking - even stickier batters are fine. Size is ideal, not too big not too small. Excellent item, these glassine liners are a must for bakers! The colors remain vibrant and aren’t absorbed and faded by oils. The height of the sidewalls accommodate for a nicer fuller looking cupcake. I love these liners! They are awesome for bakeries, they give cupcakes a much fuller and larger look! My customers love the size they leave my cupcakes! These cupcake liners are so perfect to me! They are the best ones I have found! I use them for my cupcakes and they are a lot higher than the regular ones that you buy at the store . The best! These baking cups add such an elegant touch to our cupcakes. Although the size is a little bigger than the regular cupcake liners they're perfect for when you want that high-end bakery look. I love there glassine liners !! They are amazing and hold shape so well! These are the only liners I will ever use again. They don’t get greasy and make my cupcakes larger than other home bakeries in my area. I would recommend them to anyone who’s looking for a taller cupcake but not jumbo! These Glassine Baking/ Candy Cups have come in handy! We've used them for baking cupcakes and putting chocolate covered strawberries in them. They give a classic professional look! We love these cupcake liners because they are taller than standard sized liners. They have no odor and look great. We use these for almost all of our cupcakes. These are the perfect size if you're looking for a liner that is a little bigger than standard grocery store. And they dont have a weird smell that a lot of them have! Great liners. They did not leak much oil from the batter. The cupcakes were bigger than the standard ones that you purchase from retail stores. Everyone enjoyed the bigger cupcakes. These are perfect for times when you don’t want a ‘muffin top’ stuck to your pan. The extra height of the baking cup prevents the batter from spreading out onto the pan. These are also great for cupcakes! These cupcake liners are great and grease free. They hold up well to baking and look great. I love that they are larger than normal liners allowing me to make bigger cupcakes in my normal pans. These are the perfect size. They are larger than the standard size but not as large as the jumbo. I wish they were available in multiple colors. These are perfect! No more trying to decide which flavor goes in what liner! I used these at a wedding this past weekend and they were perfect and professional! I purchased these baking cups to use when I make gluten-free muffins or cupcakes (I use white for everything else). They are a little taller than I had anticipated and I was worried about how I would like them. However, they have been wonderful and really help to keep the pan clean without the muffin going over the top and resting on the pan. This may be a con for some who like the large muffin tops, but for my purpose they have been fantastic. Also, the food does not stick to them which is a great bonus. These cupcake liners will make your own "at home" bakery creations look professional and polished. They make a larger [taller] cupcake- and look simple gorgeous once piped with your own designs. Highly recommend this liner, they are high quality and the price point is excellent. These are perfect for making tall and full cupcakes! No more to those ordinary sized cupcakes as these are great to making bakery sized cupcakes!! Love this wrapper especially its height which gives a perfect size for my cupcake business. Definitely taller than standard wrappers found at the grocery or craft stores. The price here is unbeatable. It's grease proof too which is awesome. These baking cups are wonderful. Its an extremely great deal. They look wonderful when the cupcake is finally done being decorated. The cake does not stick to these. I love using these wrappers for cupcakes. They are taller than a traditional cupcake liner, so it allows for more batter, and frosting ration. Love! The candy cups are awesome! we have many of our own made candies that we put into these cups they are small efficient and SO easy to use. very easy to throw away and they are perfect for all of our candy needs. These are perfect for our large size bars. They don't get greasy unlike the white wrappers and instead they absorb the grease from the products. I haven't used them yet but I can't wait. This are the big size not the standard ones however they are really nice material and holds the shape. It can be used for mini cakes. I like these baking cups, they gave me no issues, and the height just make them look more professionally made. And the color is a plus! I've always loved ordering these brown baking cups. They give my cupcakes an extra polished, professional look. I've noticed, however, that over time, they are not the same quality as they once were. They sometimes tend to crumple as I pour batter into them. That's disappointing because I highly favor consistency with my business. I was skeptical about buying these because of the size, but I'm glad I did buy them. They are the perfect size for cupcakes and muffins! I was not overwhelmed by these. They got very brittle after baking. A couple actually crumbled when people tried to peel them. I found they did better on batter with more fat than drier crumbs. They were not awful just not the best for my daily use. This is a great product at a great price! These baking cups are 1/4 inch taller than a standard cup and it really makes a difference in the appearance of my baked goods! Muffins and cupcakes look very substantial and professional when baked with these liners. Great liner for jumbo cupcakes! I use these to make my jumbo cupcakes and they are perfect! fit perfectly in jumbo cupcake pan. great quality, greaseproof! will definitely purchase again and again! Exactly what I was looking for!!!! After many attempts to find the perfect baking cups, I must say these are the best!!!!!! These cupcakes are the perfect size for a standard size bakery cupcake. I am glad that I found them and I am able to give my customers a nice size cupcake. These cupcake liners are a bit bigger than the "standard" size liner. They are the size you would see in your bakeries or cupcakeries. Love this size. I have been searching everywhere for brown cupcake liners in this size. They fit perfectly in my cupcake pans and containers without a problem and the price for the amount you receive, you can't beat. These baking cups are fabulous! I now use them for all if my cupcakes and muffins with great results. The taller size makes anything baked in them stand out from the crowd while not being so large that they are awkward to handle. These are excellent priced and great quality. They peel off easy for my gluten free cupcakes. Some papers burn or stick and these are fantastic. Originally I loved these baking cups, however as time went on I found them getting ruined every time I'd bake a batch & they'd crumple up whenever I put the batter in. Super disappointing. We appreciate your review, Michelle! If you are looking to purchase different baking cups, please contact our Customer Solutions team for a recommendation. I've been using these cupcake liners for over 2 years now. You really can't go wrong with the price and quality of these brown cupcake liners! Great product , great price, makes all I my baked goods look professional and nice. Definitely recommend these in any size that you are looking for. LOVE these baking cups! They fit my standard sized cupcake tins, but they sit approx 1/4" higher than the sides of my pan. I love that they're taller! I can make larger cupcakes without having to make those jumbo ones. They're heavy and grease proof-- a total winner! Love these cupcake liners! Makes my cupcakes stand out from my competition with a more professional look. I also love how the brown liners make my frosting pop. These are great for cupcakes, muffins and even candy cups. Webstaurantstore always has a great product at a really great price. Love their customer service also. The BEST cupcake lines. They look professional and hold their shape extremely well. These liners work well with all types of cake batter. I highly recommend. These baking cups are super nice! the quality and price are amazing. It will make a really good size cupcake, but I use them for other pastries as you can see on my picture. It's hard to find square or rectangular liners, so since these are big I use them for brownies and pastries that way they aren't all there in a plate without anything to take them with. I really like how the look for this type of sweets and since there are so many in one bag, you will love to use them for other purposes. I bought 500 packed of this helpful must have cupcake liner! I use it a lot for both blueberry and banana muffin. The tall size helped it looks like store brought. I have a muffin tin that it slightly taller than most and I have been looking for some liners that would fit it better. These are perfect! They are also good quality and I like the color. I am very happy with them. I'm being somewhat critical of these, because I thought these are what the pros use (I'm a home baker), but for the price - you're getting more for your money (and they're still slightly better than the grocery store brand liners). This size liner is good (2" x 1 3/4") if you are going to put a lot of decorations on your cupcakes, or perhaps use them to make large muffins. If you only plan to use minimal frosting, then get the size that's not quite as tall. There is quite a bit of bleed-through (I used butter, not oil in my batter), so I was disappointed because I thought the liner's coating would prevent that. Also, the batter stuck to the liner after baking - again, something I thought this liner could prevent (I usually spray a light mist of non-stick spray in my liners, which works wonders...looks like I won't be able to omit that step with these liners as I had hoped). Overall, a good value. These cupcake liners are the perfect size for standard cupcakes. I love the brown color as it is neutral and rustic. They peel off the cupcake easily and you can't beat the price. These baking cups are perfect for my cupcakes and they make my product look professional, neat & delicious! I love how easy it is to remove the liner from the pastry, my customers love this one! These are a little bigger then I expected but I love them. They look professional and the price was great! They looked awesome for my cousins party! I am in love with these liners! They are much taller than the ones you get at the grocery store. They give my cupcakes such a polished, professional look. And I don't have to worry about the batter overflowing anymore - bonus! These were slightly large for my standard size pan but they worked fine. I like the height. They look like what a cup of a cupcake would be. The quality is great. I wish these were offered in other colors, especially white which would make the choice so much easier. This is a great product. The Glassine Baking cups are very sturdy, and seem to bake cupcakes better than white. I love the brown color because they don't show the browning that white do when vanilla cupcakes bake. It makes them look more professional. All in all, a great product at such a great price! I have been looking for this size EVERYWHERE. I was so happy and excited when I saw it was carried here. Shipped in plastic wrap so they were a little mushed but I could still use them. I think a cheap plastic container would be better to assure no damage would occur during shipping. I will be ordering more ASAP. These baking cups are awesome. They are made of strong paper not flimsy like others. I use them for cornbread cupcakes and they turned out great. Love these baking cups. Slightly larger then the normal baking cup means a nice sized cupcakes for my customers and room for extra frosting, which is never a bad thing! These are a great quality brown liner that worked perfectly on a large wedding I did recently. They fit my pans well and my cupcakes came out beautiful in them. Great cupcake liner, and an amazing value. These are slightly larger than standard cupcake liners but i love them. The color doesn't run or fade after baking. Good quality, these liners are slightly bigger and taller than the standard cupcake liners, they work well and make our cupcakes look very nice, our customers like the bigger cupcakes! These are slightly larger than what you'd find at most retail stores. We love the color as it doesn't detract from the beauty of the cupcakes. We also use them under our bars. i was so happy when i found these on your site, we have been looking for the right taller cupcake liners, we have been wanting to give our customers more cake with their cupcakes but not a jumbo cupcake, this will be perfect. and they were the right price as long as you order them with other products due to the shipping fees, but we will be ordering more. Thanks again we love all the products we get from Webstaurant. I love these! Nothing, and I mean nothing, sticks to this glassine. I think the dark color complements the vanilla and chocolate cupcakes and blueberry, date and corn muffins I make most often. It especially complements chocolate cupcakes. This size is a little higher than the well-rim of the 12-well aluminium 3.5-ounce cupcake pan that I purchased here, but after icing, the higher profile looks very nice. Another plus with the higher profile is that it prevents over browning of your cupcakes and muffins. I will certainly repurchase these if I ever run out. They're great! The perfect cupcake/muffin cup! It's almost a lifetime supply, but this is an awesome product and such a great deal. We also bought these for our grown children and they were very appreciative as well. The price is unbelievably low. I LOVE these cupcake liners! They are taller than the average cupcake liner so with the same amount of battler I get a much taller cupcake and I think that that produces a more grand, professional looking cupcake. Be sure to not overfill and you will get beautiful tall cupcakes! Love these. I can only find this size here. The perfect size for a cupcake. Larger than most but not a giant size, Bakes nicely with 3/4 full of batter. Perfect size for a taller cupcake. Durability is good and want "peel" from the cupcake like many other baking cups do. Great value and these will make your cupcakes standout. Aahhhhh I have mixed reviews on this!!! I have bought this product 2 times. The first time AMAZING I only had a few fold on me when adding batter so I bought them again.... not so good! This time every single one of them folds!!!!!! I couldn't even use them! Very upset. They seem to be bigger/flatter when i got them, like maybe they lost their shape? I want to give them one more chance and HOPE they are better! I love these! I've been using these cheap white ones for awhile and after they come out of the oven, I feel like they're too small. These brown ones on the other hand are the perfect size. I've add pictures for comprison. Although, I can't tell if they are really grease proof, the dark colour will hide all the grease that seeps out. Will definitely purchase again. The cups make my baked goods look more professional like the ones you find at the bakery. However, I wish they were greaseproof. The cups fit a standard size tin. I love these taller cupcake liners. Starting out I used the store bought liners, which are a standard size of 2" base x 1 1/4" height. These taller liners allow for a better presentation without using any extra cake batter. These are a must have for the professional baker. These cupcake liners are the perfect size for muffins ! I love them and they're my go to muffin liners! The brown liners make the desserts look so chic! These by far, are my favorite cupcake liners. They give our cupcakes/muffins the perfect height and plumpness, plus a nice professional uniform look too! These are Greece proof and are a great quality baking cup for an amazing price! I will be buying these again and again! I thought these liners are a great buy. The look very professional and I like the tall size for larger cupcakes (or standard cupcakes with really high frosting). My only complaint is that I used them with the 12 Cup Aluminized Steel Cupcake / Muffin Pan 3.8 oz. 13" X 18" pans and they did not fit well. The muffin pan specifies a bottom diameter of 2 1/16" and I assumed these liners with a bottom diam. of 2" would be okay. In most cases, the liners worked fine but a few of them bunched up from not fitting in the pan. These liners are the perfect size for our event cupcakes, and are elegant enough to use for weddings, but inexpensive enough to use for everyday orders. Great purchase and will be purchasing again! Very good quality baking cup... The height listed on the site is accurate, and the size is great for baking larger cupcakes that have more frosting on the design (such as flowers). The cups stand up nicely in the cupcake pans once you put the batter in. I love these baking cups for my Chocolate Coated Strawberries! The size is perfect for my boxes and the price can't be beat for the quantity. These liners are great. I can use my standard muffin pans but give my customers a little more. Plus they make the cupcakes look more professional than a standard white liner. I use these cups to allow my bakery to have a "uniform" look for my daily cupcakes that are sold daily in store! Great look in my display case! These are nice baking cups that don't stick to cupcakes, but are easy to pull off. The dark brown is a nice touch for professional products or a neutral to distinguish different flavors. It's the perfect color, perfect size for our cupcakes! Our customers love it! It fits perfectly in our baking pans and they bake just right without deformation. Love, love! These are just the thing for tall, plump cupcakes and muffins. They are grease-proof and give a professional finished look. I think these are much more beautiful than the standard white liners and they make and especially nice presentation for chocolate cupcakes. These have worked out great for my muffins & or cupcakes. They don't look greasy after baking & have great release. Very pretty too! Will buy again! These cupcake liners are great for baking a little larger cupcakes (compared to standard size). They will not leak grease or fade when baking. They worked beautifully for our fall wedding. Nice upgrade from my other liners that are 2 x 1 3/8" even though it may not seem like much of an upgrade, it made a big difference in height. I used these liners with the 24 muffin pan I got from Webstaurant as well and that seemed to help with resulting in taller cupcakes. Glassine is suppose to be "greaseproof" and it did seep some of the butter into the liner however I let the cupcakes cool out of the pan on a wire rack before storing the cupcakes and that seemed to have helped the problem. Aside from that I just love how tall my cupcakes are with these. I use these as cupcake liners for all my cupcake orders. They are good quality, they don't bunch up. They don't lose their color. The cupcake doesn't stick to the liner so you can easily peel it away. BUT it also doesn't become loose after its baked (like some cheap liners tend to do). Basically it does all you want a cupcake liner to do, perfect, high quality liners. I will purchase again. They make some bigger cupcakes than the standard size. Perfect to place under large truffles resulting in less handling in case. Clean and neat as well as approved by local health department. Nice addition. My favorite cupcake liners! This size of these liners produce slightly taller cupcakes than standard, which is what I prefer. The brown color is classy but still can be use for any occasion. I will order again. Purchased this product for a wedding. The bride wanted cupcakes. They were just the right size and the color was amazing. Will order this product again. These work great for my cupcakes! They give my cupcakes an elegant look! They work great in my square pan and allow for big, square cupcakes! Love these baking cups! check your measurements when ordering they are a little larger(taller) than a standard cup. They make a great presentation for your baked goods. Did not care for these cups. I bought them for baking cupcakes, and while they worked, they did not keep the butter inside. When you pick up the cupcake, you immediately get your hand greasy. I think this would work much better as a candy dish. Thank you for your review! Try doubling the glassine cups to eliminate grease, or you could purchase foil cups such as the Ateco 6432 silver baking cups instead. Check out our Baking Cups Buying Guide for more information. This is a really nice product, I like the material that it's made out of also. I didn't realize that they were the tall size but it turned out for the better, especially when you accidentally put a little more batter in the cup than you meant to. I love these baking cups! There was a very minimal amount of grease after baking, and the presentation is beautiful. They make the cupcakes looks so elegant, I wish they were available in standard size also since these are a little larger than a standard cupcake. They will fit into a standard pan, however. This is not the first time we've ordered these cups, and the quality seems to have changed a bit. The cups seem a little bit thinner than they used to, and quite a few from each pack aren't cut properly. Overall, they're still a good value, and one of the few I've seen in this size! These work great as both muffin/cupcake liners and candy holders. They are made from glassine paper so they are much more grease resistant then regular paper liners. These liners are perfect for muffins and cupcakes. Grease proof and easy to peel off. The dark color gives a beaautiful and professional look. Great price too! These are for jumbo sized cupcakes and muffins. I read a previous review saying these were standard size. They are NOT-these are jumbo. If you use jumbo for YOUR standard size, well then. I use these for my gourmet muffins are they're beautiful! And this is a pic of this wonderful cups!!! Looks very very nice! This cups are awesome... Perfect size..... Incredible quality for this price!! !!! Exactly what I was looking for. Standard cupcake liners began to look smaller and smaller to me. And I was looking for something bigger that would allow me to frost my cupcakes nicely. FOUND IT!!! They are so much bigger than I thought! It made my standard cupcakes look bigger. I was thinking of using it for my jumbo cupcakes but I like the look of my standard size cupcakes now. They are much taller and it look so much better. I can do more elaborate frosting design without drowning the cake part. I really like these liners! I was looking for a tall cups that would fit into a standard size muffin tin and I was a little hesitant because of the stated size, but they fit PERFECTLY! They may a nice tall muffin or cupcake and the icing or sugar, or whatever you put on top does not fall out! I will be ordering more. i use these liners all the time. They are such an improvement over the washable bags. They're strong enough to stand up to use, and it's so convenient to be able to throw them away when you're done. I will never be without these again! I like that quality and quanity of this item. It is a good sturdy feel to it and for the price this is a great buy. These liners are wonderful. They meet the quality standards that I need to satisfy my customers. The are truly grease-proof and do not wilt regardless of the type of batter used. Thanks !!! I absolutely love these cupcake liners! The quality is amazing and they make my cupcakes look beautiful. About to order some more for the holiday season! These are perfect! They fit a regular cupcake pan but are about twice the size of a regular cupcake!! The make them really tall!! My customers love them!! I'm very happy with the Glassine Baking Cups. It makes making my mini blondies so easy. They peel off real easy and nothing sticks to the wrapper. These cupcake liners are wonderful! They fit in a standard cupcake tin but come up a half inch higher than standard liners, resulting in a tall, bakery-style cupcake. The tall cupcakes are particularly great for filling, and the dark brown color nicely complements light frostings. Great baking cups. They look great and hold up to all sorts of batters. I like the uniform look they give to cupcakes at a cupcake display. I love these liners! They are bigger than the standard size but smaller than larger muffin liners. They are also sturdier than most and peel neatly off the cupcakes. The dark color is a great contrast to any decorations. Love! These cupcake liners are GREAT! I use them for my jumbo cupcakes. The cupcakes come out pretty big compared to the standard liners. They use more batter, as well. Wouldnt use any other liner. Perfect! Plus, the price is awesome. 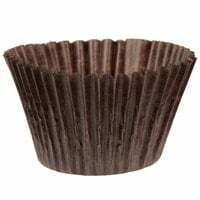 I use these brown glassine baking cups for my cupcakes that I sell at the farmer's market. They are wonderful. Not only are they good quality, but they never pull away from the cupcake, and they look beautiful. Excellent product for a very reasonable price. I used these in a standard muffin pan. They stood up about a half an inch taller but worked well. I tried them with my cinnamon for easier serving and transporting. Very nice presentation and good for individual portions. Held the frosting well too.